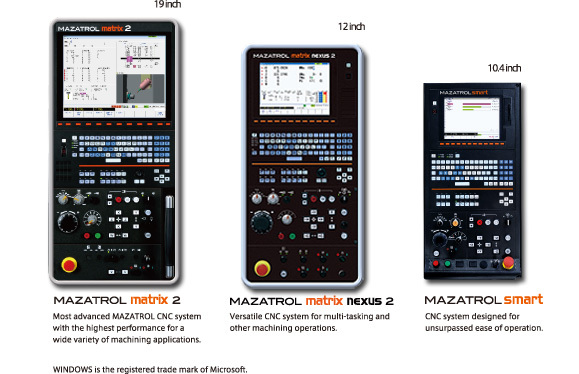 The MAZATROL, the first conversationally programmed CNC system in the world, was introduced in 1981. In 1998, the MAZATROL was fused with a personal computer that incorporated our extensive expertise for unsurpassed operating efficiency. Today, MAZAK machine tools are equipped with three different MAZATROL CNC systems - all incorporate the latest technology in order to provide higher productivity. Both conversational programming and EIA/ISO program format standard equipment. Easy programming thanks to automatic determination of cutting conditions, automatic programming checking and other advanced functions. Reduced processing time thanks to the latest available hardware and advanced software. A QWERTY keyboard is standard equipment providing the same data input operation method as a personal computer.